It’s another long night for me. No sleeping, I suspect. And yet I’m procrastinating instead of working (well, what’s new, I ask myself). I am at my desk past midnight–designing, not writing, and yet I believe it is not less important. Design is language, too, I realised. I work with shapes and colours, instead of words, and I keep at it until it’s done. I keep at it until I’ve said what needs to be said. I’m aware though that I haven’t found my ‘voice’ in this medium yet. You know how, in our writing or in the things we read, we can recognise who it is because of his or her voice? It’s the same thing with design, only you work with various tools, instead of the (metaphorical) pen. I suppose, in a way, everything we do–whether it’s photography, or dancing, or what-have-you–we are all trying to say something, and we need to have a voice to do it. Something that is consistent, something that will identify us as the speaker. I must have said this a lot of times over the years, and over the course of our correspondence–I want to be more present in this life. In my life. I have never been more alive than when I am creating and working on my art, but how often does this happen really? I must find a way to make opportunities for myself instead of just waiting for the opportune time. Also, to relearn: to make mistakes again. I have made a lot lately–have been making them still, but I don’t think I am allowing myself to go to it willingly. To be able to say to failure: “come what may,” and really mean it, you know? Because what my life is, lately, seems to be a series of stumbling into circumstances where I have done wrong things, where I have done things wrong. And I berate myself for it, as if such things could’ve been avoided if only I was smart enough, good enough, prepared enough. The thing is–we could never really be prepared, no? The world is turning, and turning, and turning. 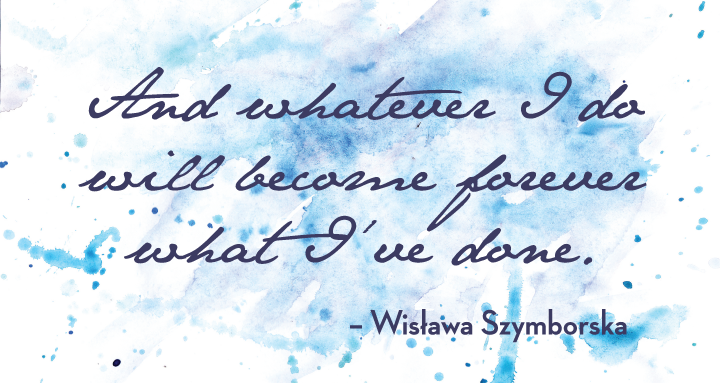 And whatever I do / will become forever what I’ve done.